In a new column posted this morning, Firedoglake's Jane Hamsher renews her call to defeat the Senate health bill--a position, I know, many of our mutual friends on the left share. I respect her right to that opinion. I respect the fact that she's making substantive arguments about what the Senate bill would mean for real people. And I really respect the effort she's made, over the last few months, to promote the cause of health reform. But I still think she, and those who agree with her, are wrong. (1) Forces you to pay up to 8% of your income to private insurance corporations--whether you want to or not. (3) Many will be forced to buy poor-quality insurance they can’t afford to use, with $11,900 in annual out-of-pocket expenses over and above their annual premiums. Both statements have (some) truth. That's why many of us have been calling attention to these numbers for months. But a crucial question, which Hamsher and most lefty critics I know never address, is "compared to what?" As it happens, my new column for Kaiser Health News, which is now online at TNR.COM, addresses that very question. Nate Silver did a version of this last week, for one sample family. 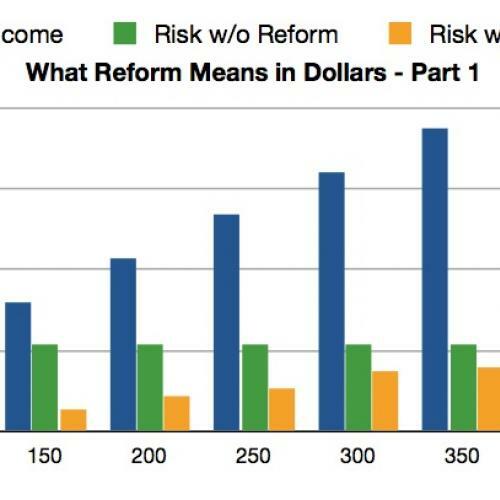 This is a follow-up and it comes to the exact same, unambiguous conclusion: Reform reduces the risk of lost income dramatically, particularly at lower incomes. To get a better picture of what that all means for actual people, here's a graph showing people's incomes (the blue bar), the amount they could pay in medical bills without reform (the green bar), and the amount they could pay with reform (the orange bar). Translation: This is a hugely progressive program to bolster economic security, the likes of which we haven't enacted in this country for a long, long time. To be clear, I don't think these numbers are great in absolute terms. As I argue in the article, progressives absolutely should push for better subsidies and more protection in the conference negotiations--and then, if the law passes, to work on improving the law in subsequent years. But you can't do any of that if a bill doesn't get past the Senate. That's why prominent, reliable liberals like Sherrod Brown, Paul Krugman, Bernie Sanders, and Andy Stern all think the bill needs to pass--and why I do, too. *I realize that Hamsher and others on the left think that, if the Senate bill goes down, we'll end up with something better, perhaps through the reconciliation process. I think that's highly unlikely, for reasons I'll take up soon.